Support of many different digital brushes e.g. chalk, charcoal, pencils... A wide variety of adjustment settings to customize the default brushes or to create new brushes. 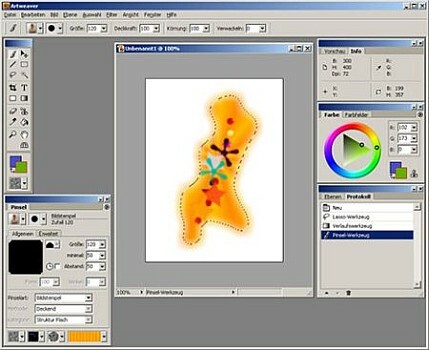 Standard image editing tools like gradient, crop, fill and selection tools. Support for the most common file formats like AWD (Artweaver), BMP, GIF, JPEG, PCX, TGA, TIFF, PNG, and PSD (no layer support). Transparency and Layers support. Effect filters like sharpen, blur, emboss and mosaic. Editable text layers. Pen Tablet support for a realistic feeling. History function to und/redo last editing steps. Expandable by Plug-In modules (Artweaver Standard). Support for many languages through language files.